Subsea Asset Location Technologies (SALT) Ltd has developed the SonarBell and related technologies. 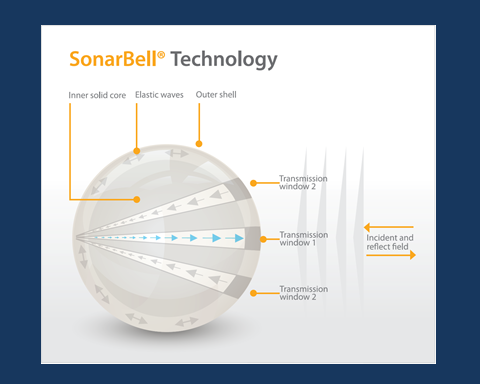 SonarBell operates by focusing and reflecting sound energy back to its source, much as a lens or mirror can focus light. Just like a lens or mirror SonarBell is a completely passive device. By focusing and re-radiating the sound energy back in the direction from which it came a 200mm SonarBell can deliver the same sonar target strength as a 2m diameter metal plate whilst being relatively light weight and easy to handle. In contrast to other technologies used for the location of assets SonarBell does not suffer from the intermittent reflection of corner reflectors nor does it require the battery replacement cycle of transponders.